Situated on Grouse Mountain, this wildlife sanctuary has a pair of very famous residents: two orphaned grizzly bears named Grinder and Coola. Additionally, the refuge also houses birds of prey, including resident owls, plus a hummingbird feeding station, where researchers monitor the tiny feathered fliers in spring. You’ll need an admission ticket to Grouse Mountain; you can buy one in advance that includes round-trip shuttle transportation from downtown Vancouver, the Skyride aerial tram, the Peak Chairlift (summer only), and a 45-minute lumberjack show, as well as access to the wildlife refuge, where ranger talks are held regularly in summer. For a special experience, book Breakfast with the Bears, which includes early access to the refuge, a ranger talk, and breakfast at the Grizzly Lookout Cafe. The refuge can also be visited as part of North Shore day tours from Vancouver, which typically combine Grouse Mountain and Capilano Suspension Bridge Park. 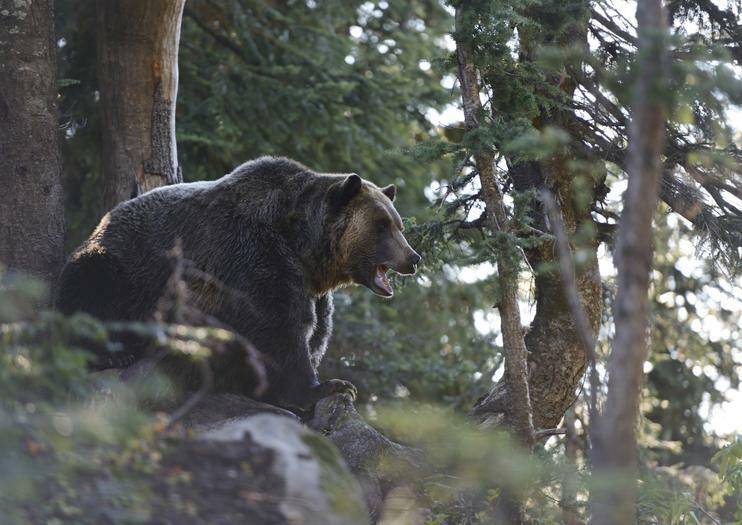 Grouse Mountain Refuge for Endangered Wildlife is a must for wildlife enthusiasts. There are dining options at the mountain; the yurt-style Grizzly Lookout Cafe offers the best views of the grizzly bear habitat. The Skyride is accessible to wheelchair users, as is the refuge, which can be accessed via paved pathways. Grouse Mountain Refuge for Endangered Wildlife is located in North Vancouver, about a 20-minute drive from downtown Vancouver. Shuttle buses, free with a Grouse Mountain admission ticket, run from Canada Place in summer. The best time to visit is between May and October when the bears are usually out of their den, and when rangers give talks. In winter, the bears go into hibernation and can’t be observed in-person, though you can watch them slumbering via a live webcam. Known as the Peak of Vancouver, Grouse Mountain is an outdoor playground for nature-loving urbanites. Fit visitors can attempt the steep hike up the Grouse Grind, where they can check out all the mountain facilities, before taking the Skyride back down. In addition to lumberjack shows and the refuge, Grouse Mountain offers ziplining in summer and skiing and snowboarding in winter. Tilpas nogle episke naturlige sightseeing i din Vancouver ferie med en halvdags tur til områdets smukke North Shore. Din personlige guide vil eskortere dig over Lions Gate Bridge til Capilano Suspension Bridge for en spændende tur langs klint-hængende stier. Så kør du Grouse Mountain gondolen højt ind i alpeskoven og besøger indfødte grizzlybjørne i Refuge for Endangered Wildlife. Fly til det maleriske alpine landskab lige udenfor Vancouver med denne adgang til Grouse Mountain, en kulturel og udendørs park, der er perfekt til hele familien. Nyd chancen for at observere truede dyr som uger og bjørne, eller se parkens samling af rovfugle, når de svæver gennem luften. Du kan også nyde en tur på et af de længste flytrafik i Nordamerika, gå snesko og se et tømmerhuggeshow plus meget mere. Sammen med din Grouse Mountain optagelse, er der en shuttle (først til mølle) fra downtown Vancouver og kør på parkens højde stolelift. Tilføj en spænding til din Vancouver ferie med en privat rundtur i områdets mest spændende udsigter. Din personlige guide vil eskortere dig til Capilano Suspension Bridge for en spændende tur langs klint-hængende stier. Bagefter kan du nyde besøget center eller tage en anden skovvandring, før du kører Grouse Mountain gondolen højt ind i alpeskoven. Få en fantastisk udsigt og deltage i nogle af de fantastiske bjergaktiviteter.